I loved the sketch and knew it would be great for a number of different items I needed to check off the list of card making. 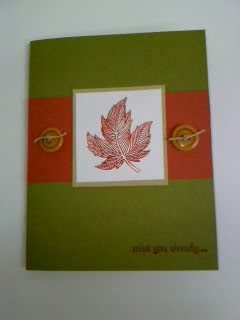 First, we have the fall like colors - Old Olive and Real Rust, with Sahara Sand. This is pretty self explainatory, however I added the sentiment below (which I am not sure if that is in the sketch rules or not?). This goes off to my Soldier boy in his first package.... since I have to remember what the rules are for the cards and such, I think I might be pressing it with the buttons.. we shall see. Next.we have what will soon become the most used stamp I have recently received... My 12 yo has decided she would like to learn to skate. I am game, until something is broken, I am all about learning the tricks and all that... shes had a few bumps, cuts and bruises. So not only is this card to be one that she can hang in her room to give her confidence, its also to encourage her to be her 'own'... since at 12 its pretty hard. I used dimensionas on the purple flower from Boho flowers punch, and added some glitter... makes it alittle more girly. 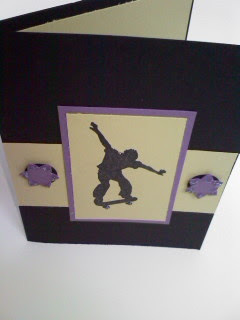 Extreme Skater is also available in the Decor Elements line, which I have already heard the "WANTS" and "NEEDS". And though you cannot tell, I did put some glitter on the wheels. This photo doesn't show some of the effects, but you get the point, I hope. She is usually hanging out in the Craft Cave with me, and since she wasn't I had to hurray to take the picture and put it away until I give it to her. Both of these are using the sketch from the LNS Challenge 41. Thank you MaryJo Williams for this simple sketch, its get me back on the ball again, and using some rubber!